Explores new sides of the Crow myth and introduces brand new characters. Ashe Corven: Congratulations, Monkey! You just bought yourself a fighting chance! Q: Is this the same Sarah from the first Crow Movie? Q: What are the differences between the Theatrical Version and the Director's Cut? Is the British Version uncensored? A Crow With Broken Wings. 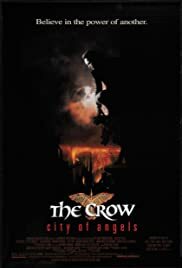 CROW  CITY OF ANGELS is the inevitable follow up to the classic 1994 gothic thriller THE CROW. The laws that state all sequels must be inferior to their predecessors are faithfully obeyed here and the result is a rather mundane and disappointing motion picture that flat lines the whole franchise. Here Vincent Perez (badly miscast) gives a weak performance as the doting single father returning from his watery grave to wreak bloody vengeance upon the gang who killed him and his son. He is aided, in his quest by Sarah; a doe-eyed tattoo artist who fans of the series will note is actually the little girl who was befriended by the central character in the original movie. 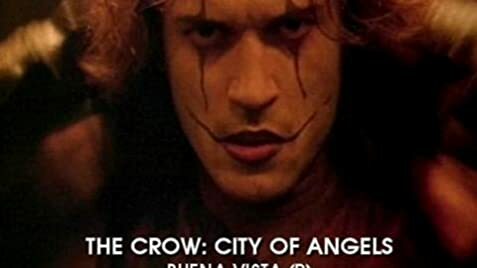 The film manages to be watchable; the apocalyptic cityscapes work quite well, however a maker of music videos directs CROW  CITY OF ANGELS and it shows in every frame. The film totally lacks the edge of raw emotion and inner pain that made the original movie so effective. All you are left with in the end is a gothic re-working of the DEATH WISH movies with nothing to redeem it once you get tired of the garish purple, yellow and green colour schemes. The main merit of this poor film is the raw performance of legendary rocker Iggy Pop as a cocaine-snorting villain. My rating  5 out of 10.